That quality which enables one to encounter danger and difficulties with firmness, calmness, and intrepidity; Hebrew, ("Be of good courage," II Sam. x. 12), or ("Be strong and of a good courage," Deut. xxxi. 7, 23; Joshua i. 6). Physical courage, the result of man's struggle against conditions that threaten his very existence, and which often develops boldness, fearlessness, and an utter disregard of physical pain, is extolled by the Hebrews as a valued possession (compare Judges viii. 21; Eccl. x. 17; I Kings xvi. 27; II Kings xviii. 20; Micah iii. 8). Often the victor was made a popular idol. "Saul has slain his thousands, and David his ten thousands" (I Sam. xviii. 7), the women of Israel sang when David returned from a campaign against the Philistines. The angel of the Lord says to Gideon: "The Lord is with thee, thou mighty man of valor" (Judges vi. 12). The examples of courage found mentioned in the records of ancient Israel are numerous. The undaunted valor of Barak, of Gideon, and of Jephthah; the fearlessness of Samson, of Saul, and of David, are eloquent testimonies of physical courage. But the Bible sets more value upon moral courage, which is so prominent in the life-history ofthe Jew, and which goes far to explain the power of resistance that he has shown at all times against those who made plans for his destruction. This courage is fostered by confidence and trust in God. "Hope in the Lord, be strong, keep thy heart steadfast, yea, hope thou in the Lord" (Ps. xxvii. 14, Hebr. ); "But they that wait upon the Lord shall renew their strength" (Isa. xl. 31); "Through God we shall do valiantly" (Ps. lx. 14; compare Num. xxiv. 18; Ps. xxxi. 25; Prov. iii. 23-26); "Fear thou not; for I am with thee. . . . I will strengthen thee" (Isa. xli. 10); "Yet now be strong O Zerubbabel . . . and be strong, O Joshua . . . and be strong, all ye people . . . for I am with you, saith the Lord of hosts" (Hag. ii. 4; compare Zech. viii. 9, "Let your hands be strong, ye that hear"). In post-Biblical times the Jew displayed both physical and moral courage while standing for truth and right against a hostile world. He would face the obloquy of centuries to support a principle which, though unpopular, he believed to be true. "Strive for the truth unto death; and the Lord shall fight for thee" (Ecclus. [Sirach] iv. 28; compare ib. iv. 9, ii. 12; Baruch iii. 14). "In a place where there are no men, endeavor thou to be a man" (Ab. ii. 6b). Crushed to earth, defeated, driven from his native soil, pining in dungeons, made to furnish murderous sport for the wild beasts of the Colosseum and food for the flames of pyres and stakes, he still refused to surrender; struggling against terrible odds for national and political independence, for liberty of conscience, and for the rights of man. 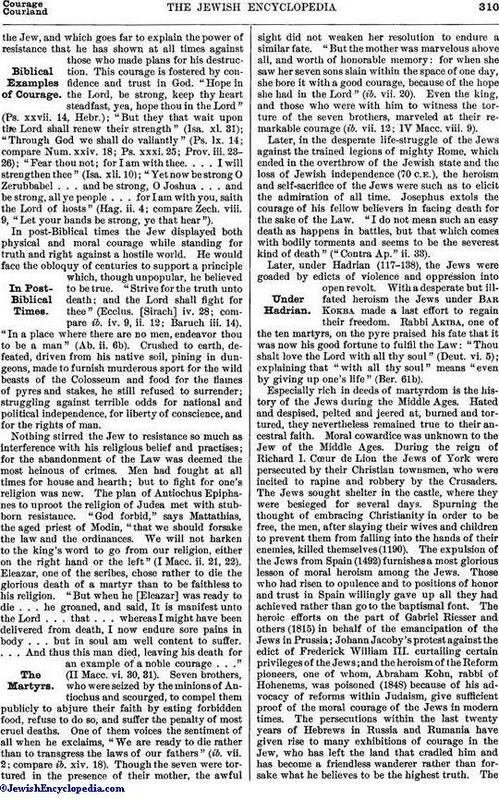 Nothing stirred the Jew to resistance so much as interference with his religious belief and practises; for the abandonment of the Law was deemed the most heinous of crimes. Men had fought at all times for house and hearth; but to fight for one's religion was new. The plan of Antiochus Epiphanes to uproot the religion of Judea met with stubborn resistance. "God forbid," says Mattathias, the aged priest of Modin, "that we should forsake the law and the ordinances. We will not harken to the king's word to go from our religion, either on the right hand or the left" (I Macc. ii. 21, 22). Eleazar, one of the scribes, chose rather to die the glorious death of a martyr than to be faithless to his religion. "But when he [Eleazar] was ready to die . . . he groaned, and said, It is manifest unto the Lord . . . that . . . whereas I might have been delivered from death, I now endure sore pains in body . . . but in soul am well content to suffer. . . . And thus this man died, leaving his death for an example of a noble courage . . ." (II Macc. vi. 30, 31). Seven brothers, who were seized by the minions of Antiochus and scourged, to compel them publicly to abjure their faith by eating forbidden food, refuse to do so, and suffer the penalty of most cruel deaths. One of them voices the sentiment of all when he exclaims, "We are ready to die rather than to transgress the laws of our fathers" (ib. vii. 2; compare ib. xiv. 18). Though the seven were tortured in the presence of their mother, the awful sight did not weaken her resolution to endure a similar fate. "But the mother was marvelous above all, and worth of honorable memory: for when she saw her seven sons slain within the space of one day, she bore it with a good courage, because of the hope she had in the Lord" (ib. vii. 20). Even the king, and those who were with him to witness the torture of the seven brothers, marveled at their remarkable courage (ib. vii. 12; IV Macc. viii. 9). Later, in the desperate life-struggle of the Jews against the trained legions of mighty Rome, which ended in the overthrow of the Jewish state and the loss of Jewish independence (70 C. E.), the heroism and self-sacrifice of the Jews were such as to elicit the admiration of all time. Josephus extols the courage of his fellow believers in facing death for the sake of the Law. "I do not mean such an easy death as happens in battles, but that which comes with bodily torments and seems to be the severest kind of death" ("Contra Ap." ii. 33). Later, under Hadrian (117-138), the Jews were goaded by edicts of violence and oppression into open revolt. With a desperate but ill-fated heroism the Jews under Bar Kokba made a last effort to regain their freedom. Rabbi Akiba, one of the ten martyrs, on the pyre praised his fate that it was now his good fortune to fulfil the Law: "Thou shalt love the Lord with all thy soul" (Deut. vi. 5); explaining that "with all thy soul" means "even by giving up one's life" (Ber. 61b). Especially rich in deeds of martyrdom is the history of the Jews during the Middle Ages. Hated and despised, pelted and jeered at, burned and tortured, they nevertheless remained true to their ancestral faith. Moral cowardice was unknown to the Jew of the Middle Ages. During the reign of Richard I. Cœur de Lion the Jews of York were persecuted by their Christian townsmen, who were incited to rapine and robbery by the Crusaders. The Jews sought shelter in the castle, where they were besieged for several days. Spurning the thought of embracing Christianity in order to be free, the men, after slaying their wives and children to prevent them from falling into the hands of their enemies, killed themselves(1190). The expulsion of the Jews from Spain (1492) furnishes a most glorious lesson of moral heroism among the Jews. Those who had risen to opulence and to positions of honor and trust in Spain willingly gave up all they had achieved rather than go to the baptismal font. 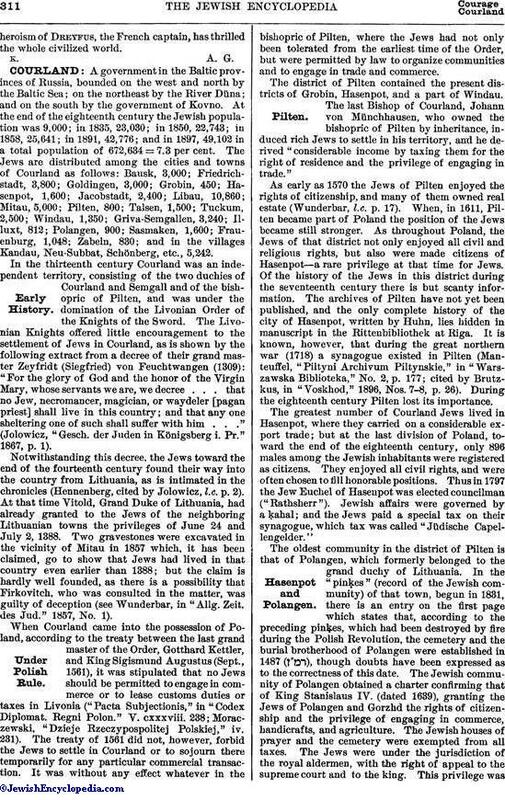 The heroic efforts on the part of Gabriel Riesser and others (1815) in behalf of the emancipation of the Jews in Prussia; Johann Jacoby's protest against the edict of Frederick William III. 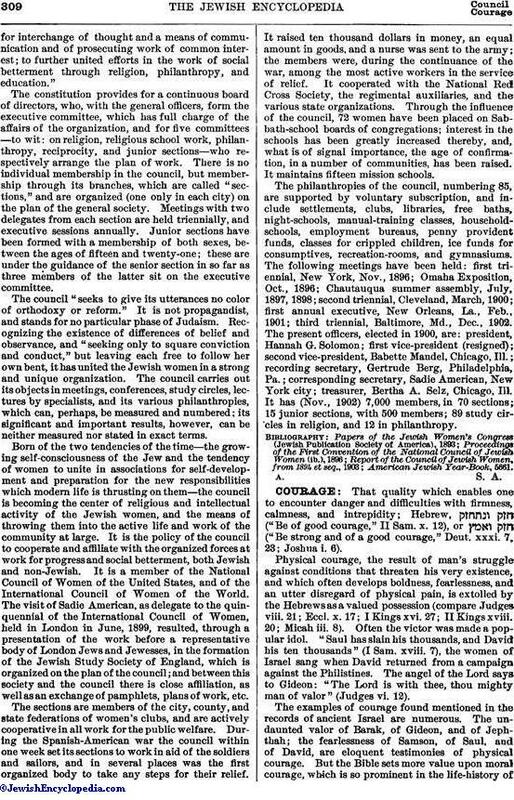 curtailing certain privileges of the Jews; and the heroism of the Reform pioneers, one of whom, Abraham Kohn, rabbi of Hohenems, was poisoned (1848) because of his advocacy of reforms within Judaism, give sufficient proof of the moral courage of the Jews in modern times. The persecutions within the last twenty years of Hebrews in Russia and Rumania have given rise to many exhibitions of courage in the Jew, who has left the land that cradled him and has become a friendless wanderer rather than forsake what he believes to be the highest truth. Theheroism of Dreyfus, the French captain, has thrilled the whole civilized world.